Proportional valves, along with linear transducers, save time in transitioning a hydraulic-press ram from rapid advance to pressing speed. In any metalforming operation, press cycle time ultimately depends on the operations to be performed, and the material to be worked. There’s just no getting around material properties, the need for dwell time, and the actions—and time—required to shape-shift a blank and achieve a desired part. That said, wasted time exists in a cycle. Tinkering with this time, via a variety of methods, can cut a precious second or two, or more, which adds up to increased productivity and profitability across a job run. To discuss these methods, MetalForming tapped the expertise of Tim Wilson, mechanical engineer at Greenerd Press & Machine Co., Nashua, NH. Here, Wilson answers questions on how metalformers can speed the cycle. MetalForming: The slowdown position of the ram may offer a means to achieve time savings. How can metalformers optimize the location where the ram transitions from a rapid advance to pressing speed just above the work location? Wilson: The transition can be optimized through a variety of actions. 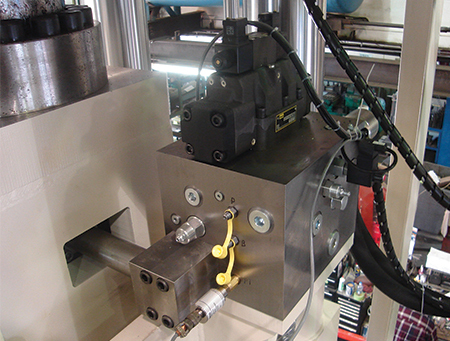 Modern hydraulic presses employ linear transducers, which provide the exact location of the ram throughout the entire stroke. An older press, without this technology, begins shutting off valves at a set position in order to slow ram speed to what is needed for pressing. Proportional valves can save some time here, given proper setup and knowledge of where to begin the slowdown. We know the slowdown position from a job recipe. The valves must start turning off completely or proportionally, reducing flow so that the ram reaches the correct speed at that actual position. With faster, more advanced valves, transition time can be reduced. Existing equipment on a press limits that capability, but upgrades provide an option. If scheduling an older press for a new electrical enclosure or a PLC upgrade, that’s the time to consider control capability that delivers the needed flexibility to quickly transition to pressing speed. MetalForming: Can ram reversal be manipulated to reduce cycle time? Wilson: If the part does not require dwell under pressure, position reversal can be a good option, with reversal based on ram position instead of pressure. Consider a high-speed 900-ton press advancing at 1400 in./min. that must achieve a 53 in./min. pressing speed. The metalformer programs hard stops, so the ram travels downward farther than it needs to go to reach a hard-stop point, with a cushion helping to absorb force. Then the press builds tonnage to reverse back up. But once a certain downward position is attained, the extra travel to a hard stop means wasted time. And, the press builds more tonnage than is needed to form the part. 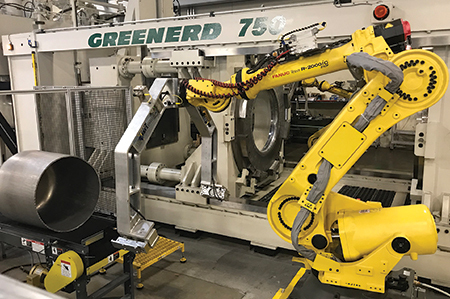 Manufacturers are recognizing the dangers surrounding equipment, and robots mitigate that, reducing cut risks due to handling sharp sheetmetal and other health risks from handling bulky, heavy and awkward parts. Or, if the work material only requires 300 tons of force to form, metalformers may, to prevent premature reversal, set tonnage at 350 or 400 tons. Surpassing needed tonnage, then traveling to a hard stop, affects cycle time. Exceeding needed tonnage means waiting for the press to compress the oil, extend all of that steel and build to that tonnage, then decompress all of that and reverse that extra distance. If the ram travels only to the position needed, you may find that forming only requires 275 to 300 tons, below the normal setpoint of 350 to 400 tons. That’s easier on the press. We see a night-and-day change in cycle time when transferring to a position setpoint as opposed to a particular pressure with a hard stop—as much as 1 to 2 sec./cycle. MetalForming: Can metalformers actually add speed to the press? Wilson: We often hear from metalformers about wanting to close daylight as rapidly as possible, but they’ll hit certain limitations in this effort. The main limitation is cost. Adding pump flow, a primary method for increasing press speed, may require adding an entire circuit to the press. The key: Examine the applications—specific requirements may be more important than speed. When buying a new press, merely jumping from one frame size and motor to the next brings a significant cost jump with little corresponding increase in speed. Know the application, and don’t specify a press to fit every possible application if all you really need is a dedicated press for one specific application. A one-size-fits-all approach can become very costly. Pre-design meetings with press manufacturers help specify your needs and fine-tune an ideal solution. Such conversations can get to the heart of what’s really important, which may not be addressed properly in a request for quote. MetalForming: Can adding automation help reduce cycle time? Wilson: Yes. If loading and unloading result in bottlenecks, a robot can greatly increase throughput. Hydraulic presses have become much more sophisticated in just the past 10 years, with robot integration now a simple task—and robots solve a lot of problems. Just manipulating a part to pull it out of the press may require greater press daylight for an operator than for a robot arm, maybe a few feet as compared to a few inches, and robots make the process much safer. Manufacturers recognize the dangers surrounding equipment, and robots mitigate that, reducing cut risks due to handling sharp sheetmetal and other health risks from handling bulky, heavy and awkward parts. We recently integrated robots into one application where an operator easily loads a flat blank, but has difficulty removing the resulting awkward part. Previously, the press would open, the operator would manipulate the part out of the press and walk it over to a stack, then walk over to pick a blank, and walk it over to the press to load—so many steps here. Now, a robot pulls the part through the back of the press while the operator feeds the next blank. Robot integration brought huge cycle-time reductions. Heavy blanks and parts also become candidates for robot integration and resulting cycle-time savings, while reducing ergonomic risks and combating operator fatigue. MetalForming: Can hydraulic presses communicate with other line equipment and effectively mesh to help reduce cycle time? Wilson: Handshaking with auxiliary equipment—optimizing initiation of a feeder, robot or other equipment for press entry and exit—offers plenty of opportunity to cut cycle time. Especially with older equipment and retrofits, we see exaggerated motion. A press ram may travel all the way up and stop, and then trigger a robot or some other equipment to feed—a lot of wasted motion. A mid-stroke setpoint versus waiting until a press top-stop provides a simple fix here. With modern equipment, we know exactly where the platen locates at all times. We know when space is free to feed while the platen is still moving, and don’t have to wait for a relay. Programming and controls will start the robot moving toward a part grab, which saves time. Or, during a blank feed, the line knows when the operator has cleared the work area, enabling safe equipment movement. Light-curtain technology senses the number of breaks and the press and auxiliary equipment can act accordingly to quicken the cycle. See also: Greenerd Press & Machine Co., Inc.